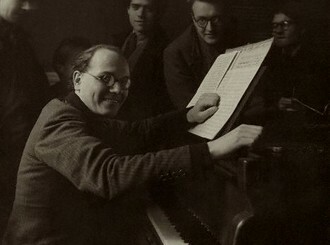 Messiaen in 1946, about ten years after Dieu parmi nous was written. Having just finished the Jewish New Year (and about a week later, Yom Kippur), it’s time to look ahead to the beginning of the Christian liturgical year, which begins in Advent. This year Advent begins on Sunday, December 2. In anticipation, I’ll be playing some wonderful French music on the incomparable organ at Our Lady of the Angels Cathedral in downtown LA on Wednesday, November 28, just following the noon mass – say 12:40 pm. Come hear Messiaen’s Dieu parmi nous in its entirety, some charming French carols, and more. I’ll be delighted to see you, and as always, come up afterward and I’ll show you the console of this magical instrument.